Hello!! 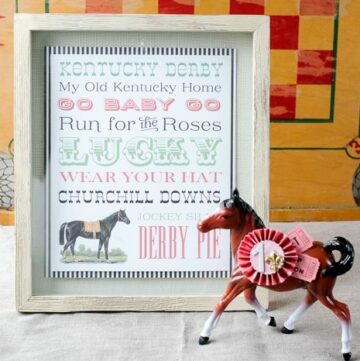 I really hope that you have enjoyed reading all of my posts leading up to the Kentucky Derby last weekend. It really is a wonderful time of year to live in Louisville and I love being able to share a bit of it with you. 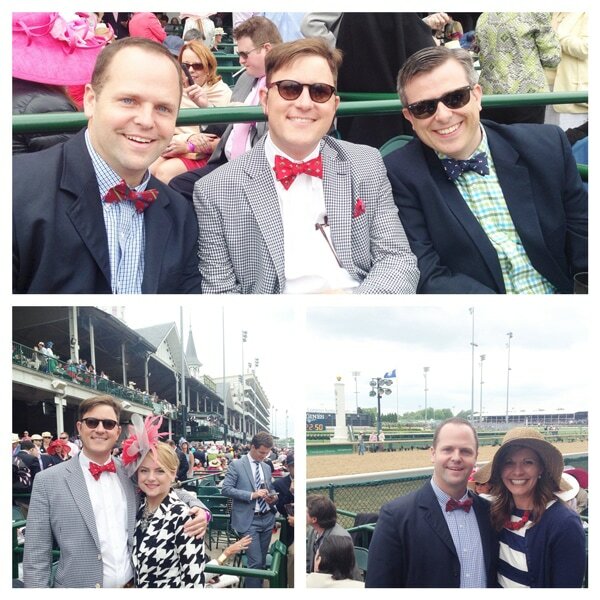 We didn’t go to the Kentucky Derby (actually I’ve never been to the actual Derby) but we did go to the Kentucky Oaks this year. 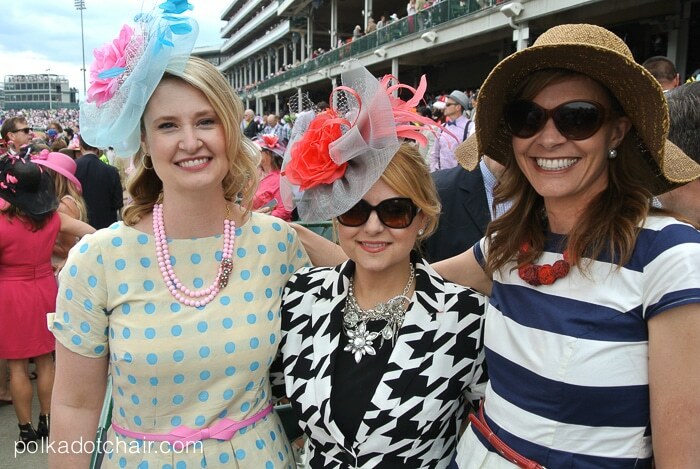 The Oaks are the races the day before, they have become just about as big a deal as the Derby. 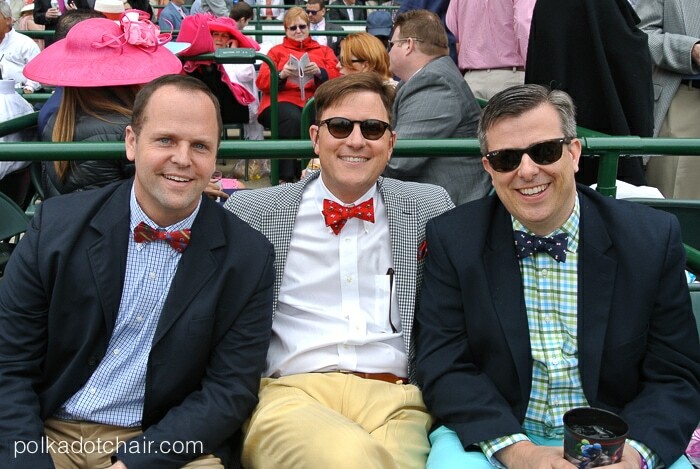 The Oaks race is actually just one race of about 12 all day long. It’s the equivalent of the Derby, but it is for the fillies. 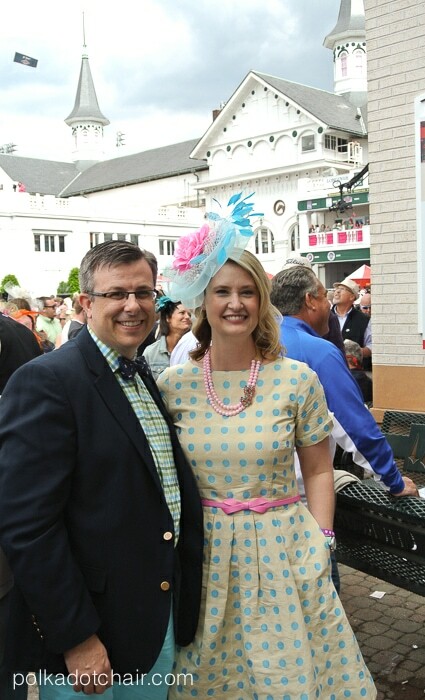 Since its a race day for the “girl” horses it’s traditional to wear a bit of pink that day. This year the weather was a bit chilly but we still ended up having a great day at the track. Let me tell you the people watching is THE. BEST. in the world, I’m not even kidding you. The place was FULL of people in colorful outfits. Hats and bowties everywhere!! It’s not really a place for kids in my opinion as most of the crowd was quite inebriated- which also make for entertaining people watching. The guys in our group looked so handsome in all of their snazzy outfits. Next year I think I’ve got Jeff convinced to let me make him a goofy hat to wear. This year instead of a hat, I decided to go with a fascinator, friend Gretchen helped me make it. She’s got a great eye for color and I’m so glad that she suggested the pinks to go with the blues in my dress (necklace is from Lulubelles.com) . And speaking of my dress.. I made it! I seriously can’t believe I pulled it off. I can sew bags til the cows come home, but clothing is a whole ‘nother thing…. 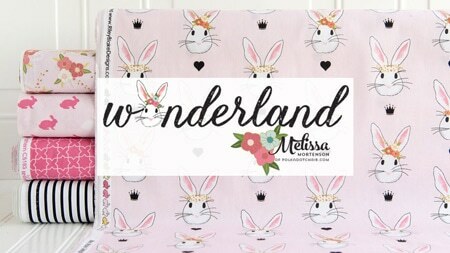 When I saw this polka dot fabric in Tissu in SLC I knew right away that I wanted it. Hello it’s Polka Dotted!! I also knew I wanted to make a dress with it, and exactly what dress silhouette I wanted. The pattern for the dress is New Look 6223- I made several modifications. I lengthened the bodice (it was about 2” too short for me). I also changed the pleats from knife pleats to inverted pleats. The knife pleats were too voluminous with the fabric (which is a cotton silk blend). I also ended up using the sleeve from Simplicity 1778 instead of the one that came with the pattern. I liked the little detail of the turned up cuff on the sleeve. The majority of the work in the dress was in fitting the bodice. The pattern was just not made to fit my body type well, because of that I might not make the same pattern again, but rather try another one. I was actually surprised how few simple fit and flare dresses there are patterns of to pick from. I had a really hard time fining a pattern with a simple classic silhouette (that I could add sleeves to).. if you know of one let me know! I had grand plans to get some really cool photos with me in the dress for the post. I mean I was at a really great location for a photo shoot right??? 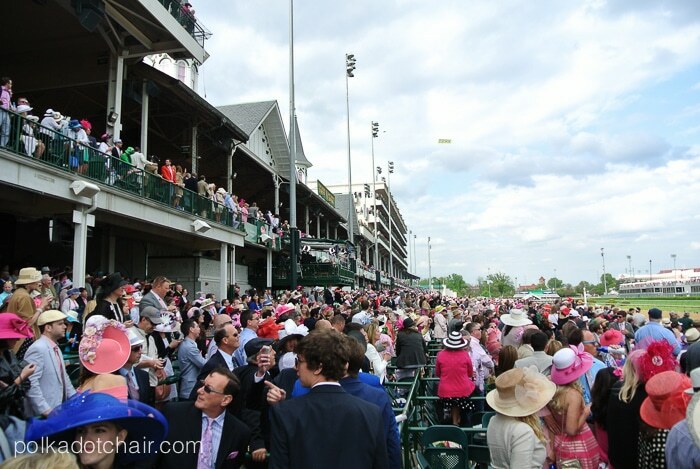 Well, it didn’t go exactly as planned, I forgot that 150K of my closest friends would be there too *wink*… and my husband kept mixing up the shutter button and the power button on the camera… mental note- next time take photos before I get to Churchill Downs…. So far I’m doing pretty well with my goal in 2014 of making more clothing for myself. I’ve even got my next two projects picked out… I may end up becoming an apparel sewist after all! 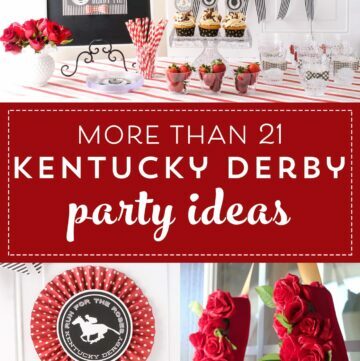 oh btw… if anyone ever invites you to the Kentucky Derby or Oaks, say YES!! You’ll have a great time, trust me!! 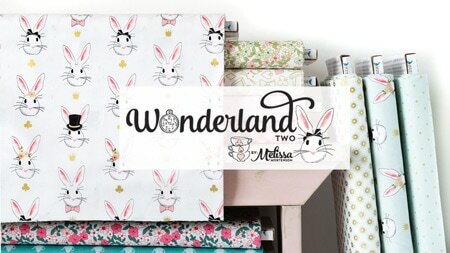 Melissa – you look so, SO fantastic!!! I am blown away. 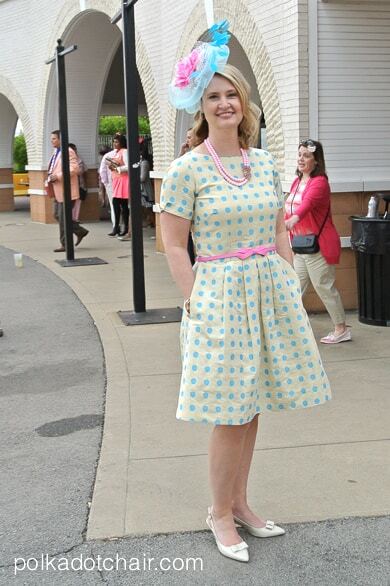 I love everything about the dress, and the fascinator and necklace really take it to the next level of awesome! Well done. 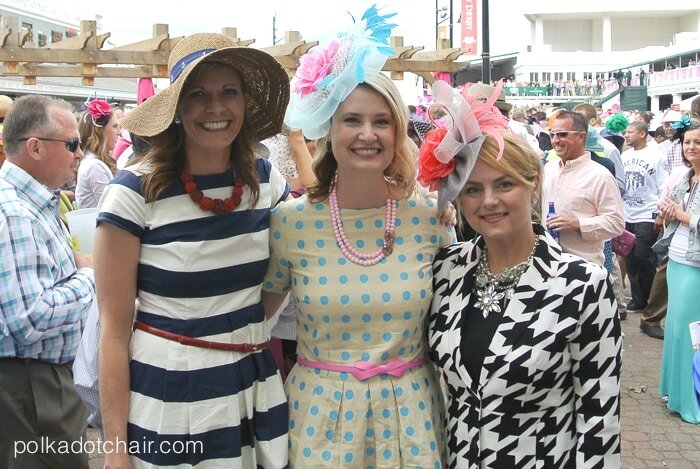 I am love the Derby and all of the festivities that leads up to it. Your dress is so wonderful and the fascinator you created is the crowning glory. Great job. You look so fabulous in that dress! I swear I’ve shown everyone I know the photos. Absolutely LOVE it! Thank you so much for the suggestion! I had not heard of Paunnet before- I checked them out and they have some great patterns.. Thanks again! I LOVE your dresses & hats! They are SO cute! 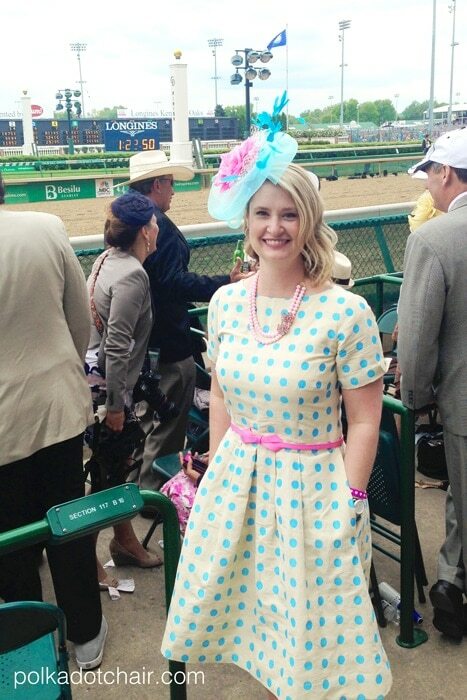 My daughter now thinks a vacation to the Derby is definitely on her list :o) And your dresses are modest!!! Way to go :o) Absolutely gorgeous! Very cute dress! 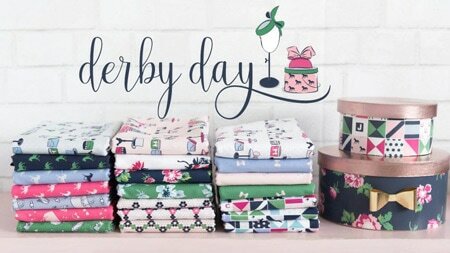 My husband and I always love to watch the derby. This year it slipped up on us and we almost missed it. We were clueless that California Chrome (the horse that won) had been bred and trained 100 miles from where we live! I was so intrigued that I had to google any and all info I could find. 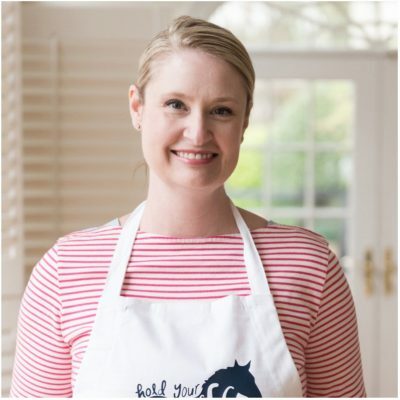 What a Cinderella story – sure to become a book and movie deal! Your dress is gorgeous! I have now added this event to my “bucket list” ! I would love to attend just to people watch and wear a great hat like yours! Thanks! It’s really fun people watching- the dresses and hats there are amazing! Love your dress. I bet you would also love Simplicity patten 2444. It’s a similar style, and super simple. I made a polka dot dress with it recently. I love your fabric and sleeves. Amazing! Thank you for the suggestion – I’m going to check that one out next time I’m at the fabric store. You couldn’t look any more perfect. 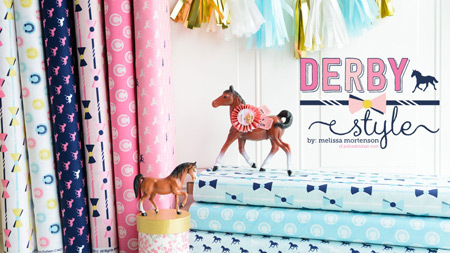 I’m dying over that fabric! 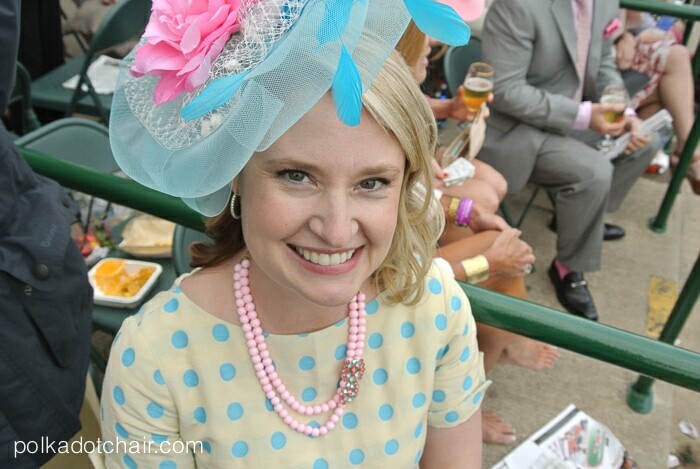 Love your Polka Dot dress,The hat and Dress are stunning! I just found your blog tonight. I learned to see when I was young. 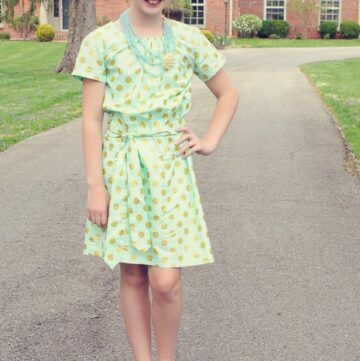 My grandmother taught me to sew and we would make Barbie clothes together. My husband bought me a sewing machine for Christmas and I am obsessed with fabrics and patterns and sewing. Anyway, I was reading through some of your tutorials and I found this post. I live in Louisville, too. I was at Oaks this year. I adore your dress. Anyway, maybe you can teach me a thing or two on my new machine!!! Oh how funny! I wonder if we ran into each other and didn’t even know it!! I learned to sew by sewing Barbie clothes with my Grandma too! If you’re looking for classes in the area, The Smocking Shop always has really good ones! Good luck and enjoy sewing! !